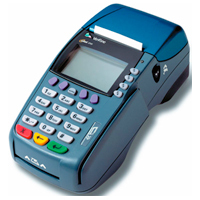 The Verifone Omni 3750 is one of the smallest and best featured processing terminals that we offer. The Omni 3750 includes a thermal printer, internal PINpad, and a smart card reader. The terminal has enough memory for the most demanding applications, and is able to handle multiple merchant accounts through a single terminal. Communications modules “future-proof” your investment. Memory configurations range from 1.5 to 4 MBytes. Advanced communications module supports 2400 bps or14.4 kbps dial modems, or provides access to IP-based LAN or WAN networks. Omni 3700 terminals are EMV Co Level 1 and Level 2 Type Approved under the most recent EMV specifications. Optional, upgradeable SAMs (2 or 4) support multiple smart card schemes and protect data. Customizable face-plates offer a variety of branding options and colors. Optional privacy shield and swivel stand. 32-bit processing and multi-tasking streamline even the most complex transactions, including EMV-based smart-card. Verix architecture with large memory configurations and dynamic memory management supports multiple payment and value-added applications. Exceptional graphics-handling by display and printer quickly renders logos, graphical fonts, and character-based languages. Integrated PINpad offers added convenience for debit and other PIN-based applications. Compact, all-in-one design preserves counter space and reduces clutter. Lightweight, highly ergonomic device is ideal for handing to customers when a PIN or other input is required. Intuitive ATM-style interface, 8 x 21 back-lit display with split-screen capabilities and large keys reduce clerk training and help desk calls. Integrated, high-speed thermal printer features “clamshell” design for “drop-in” paper loading and virtually no paper jams. Triple-track, high-coercivity card reader is included at no extra charge. Hardware- and software-based application separation eliminates re certification when adding or modifying software. VeriShield security architecture supports sophisticated file authentication, including Master/Session and DUKPT key-management. All devices are also PED-certified for PIN-based transactions and support the latest 3DES encryption algorithms.